No one likes to hear the words “You have high blood pressure”. It is usually followed by, “I am going to write you a prescription for a medication to help lower it.” Though, yes you do need to get your numbers down as it is detrimental to your health to have ongoing high blood pressure – pharmaceuticals made for the reduction of elevated blood pressure are well known for having massive adverse side effects in some individuals. Because the risk of side effects exist with blood pressure regulating medications many patients would prefer to first make some lifestyle and dietary changes and see if they can’t get it under control, naturally, first. Losing weight if you are obese or overweight to take the pressure off of your body, exercising more regularly to boost your cardiovascular health, stopping smoking if you currently smoke, and changing up your diet may all be options especially when used in combination. The standard recommendation has been to give the patient what is known as the DASH diet. DASH stands for Dietary Approach to Stop Hypertension. This dietary plan revolves around a diet rich in whole grains, fruits, vegetables, and low-fat dairy products as well as reducing the intake of saturated fats. This isn’t a temporary fix. If you are using the DASH diet it is a lifestyle recommendation. It’s ok to have a cheat meal here and there but sticking to it long term is important. Even just a small reduction of sodium in the diet can have a big effect on health. It is typically recommended that we consume no more than 2,300 mg per day. If you are over 50 this number decreases to 1,500 mg per day. The same holds true for anyone who is of African American descent as well as those who have high blood pressure, chronic kidney disease, or diabetes. If you have high blood pressure alcohol should be consumed at a bare minimum if at all. While drinking regularly and heavily has very detrimental effects, strangely, some studies have shown that a single serving of alcohol daily (8 oz) has actually may lower high blood pressure. More than that, especially if you are over 65 is considered harmful. Moderation is key. Drinking alcohol while on blood pressure medications can greatly reduce the effectiveness. Keep in mind that the American Heart Association defines an alcoholic drink as an 8-ounce glass of beer, 3-ounce glass of wine or 1 ounce of hard liquor. Make change gradual – Easing into a completely new way of eating and experiencing food and life makes it more sustainable. Write down everything you eat – Keeping track of what and when you’re eating can help highlight potential problems you might not have been aware of. Shop Smart Make a List – Going to the grocery store hungry and without a plan leads to disaster. Plan healthy grocery lists in advance to ensure you don’t stray from your diet, and always read food labels for nutritional information. Try salt substitutes – Certain herbs and spices can add delicious flavor to your food without adding the harmful sodium that salt would. Add potassium – Potassium can counteract the harmful effects of sodium and is found in supplemental form as well as in certain fruits and vegetables. Cut out the processed and fast foods – These foods tend to aggravate hypertension. 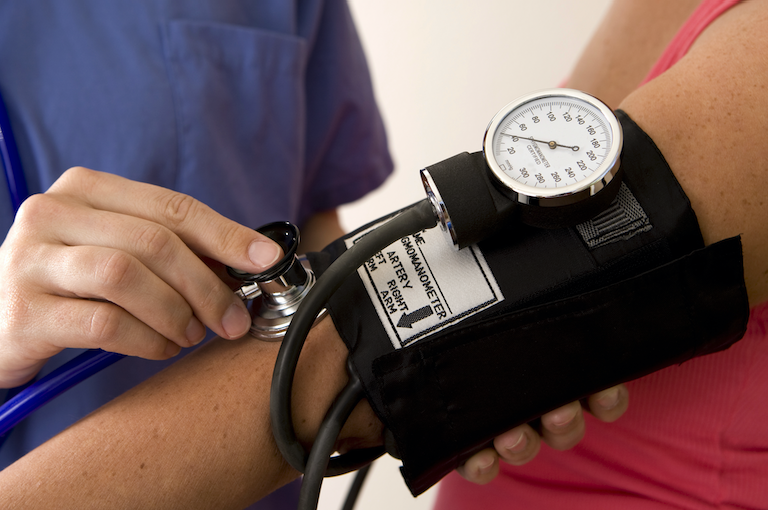 The physicians at Tampa Cardiology offer blood pressure assistance as well as the advice of an onsite nutritionist. The most important thing to remember is that changing your diet and lifestyle is a gradual process and takes a lot of hard work, but the results of longer life and healthier body and mind are always worth the effort. Get started right away. Schedule your consultation today with the doctors of Tampa Cardiovascular Associates. They can be reached by visiting www.tampacardio.com or calling (813) 975-2800.